Permanence: the pilot program automatically transforms into a full-scale program after three years. Program capacity has minimums, rather than maximums, in years two and three of the pilot. Access: the program requires 40% of projects to have a majority of subscribers with low-to-moderate incomes, and also allows non-residential participation. Compensation rates are similar to net metering and project owners can get solar renewable energy credits. Master meter holders can subscribe on behalf of tenants if they pass through financial savings. 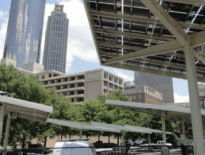 Sizable projects: each project can capture economies of scale up to 5 megawatts (DC), and utilities are required to publish “hosting capacity maps” to aid developers in finding the best places to interconnect to the grid. Access: set-asides for low-income participation have had limited success in Colorado, New York, and Maryland because upfront costs and credit scores have proven bigger barriers. Criteria: with program limits for year one, the Board of Public Utilities staff will create scoring criteria for selecting projects assuming there are more applications than capacity. This administrative step could be avoided with an uncapped program, but could also allow prioritization of rooftop projects or ones with other desirable features such as commitments to hiring people of color. The draft rules were recently released, with two public hearings scheduled and public comments open until November 30, 2018. Where used below, quotes are text taken directly from the draft rules. The pilot program launches January 1 and extends three years. The “competitive” application process will serve the pilot program’s 75-megawatt program limit for year one, and perhaps for filtering projects in subsequent years, where capacity must be “at least” 75 megawatts. The program sets basic limits to ensure widespread access. No single subscriber can participate in more than one project, or more than 40% of the capacity of a single project. (The first limitation is unfortunate, as an increasing number of U.S. businesses would like to get 100% renewable energy). The Board of Public Utilities can also cap capacity on a per-developer basis, to ensure a competitive market. The program makes a big commitment to low-and-moderate-income access, with 40 percent of program capacity set aside. To qualify for the set-aside, projects must have a majority of capacity subscribed by customers with incomes equal to or less than 50-80 percent of the area median income. The program is also open to non-residential subscribers, allowing commercial customers with limited solar access to participate. 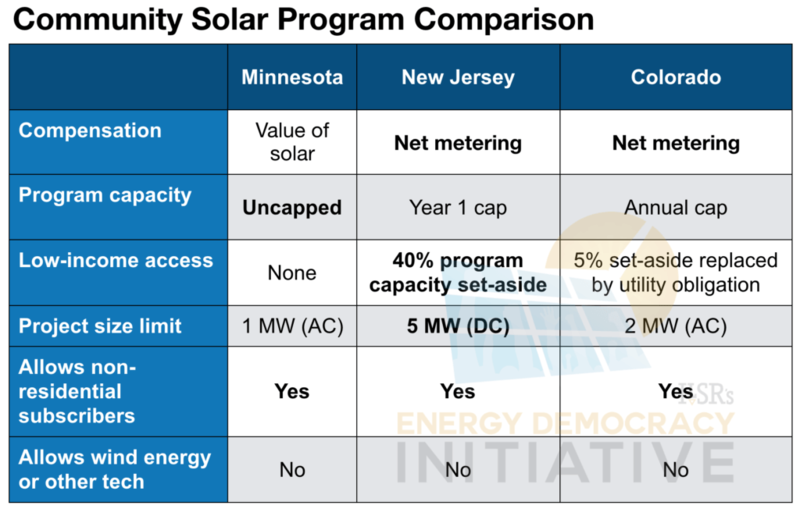 The New Jersey program allows a generous 5 megawatt project size––in DC watts, however, unlike programs in Colorado and Minnesota. Even with the conversion losses, projects will be over 3 megawatts in AC watts, sufficient to capture most solar economies of scale. In a stark contrast to Minnesota, where the utility’s complaints led the state’s regulators to prohibit the practice, New Jersey rules explicitly allow developers to economize on interconnection by allowing co-location of projects. This means multiple projects from a single developer could use a single grid interconnection point, allowing them to spread any required upgrade costs across multiple projects. A novel and valuable element of the program is the requirement for distribution utilities to provide hosting capacity maps. These maps provide developers with information on available grid capacity, to identify the most cost-effective places to build. Project subscribers can be “any person or entity. Anywhere from 10 to 250 subscribers can join a single project, per megawatt of capacity (for a maximum of 1250 per project). Subscriptions are portable if subscribers move within the utility’s service territory, and can also be sold back to the project owner. An account holder for a master meter (e.g. an affordable housing provider) can subscribe tenants if they submit a signed affidavit that benefits will pass through to tenants. Credits in excess of the customer’s electricity use will be credited at the “avoided cost of wholesale power” after 12 months. However, if a customer receives credits three years running, their subscription can be unilaterally downsized to fit their usage. 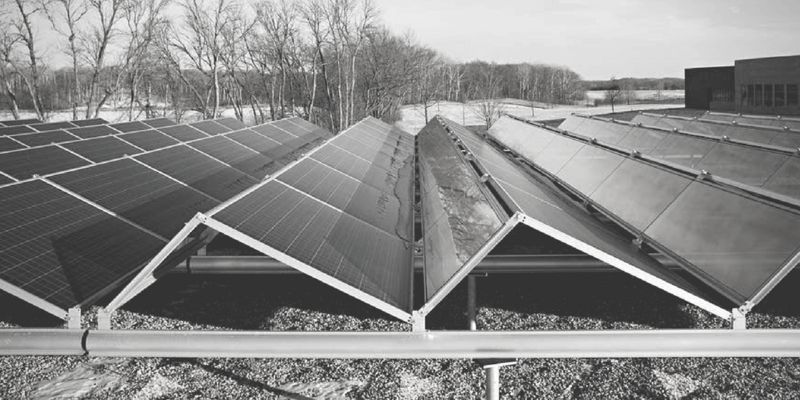 Notably, community solar projects will also qualify for the state’s solar renewable energy credit market, where prices are currently around $220 per megawatt-hour (22 cents per kilowatt-hour) for credits sold on an annual contract. Longer term contracts can be secured at lower prices. However, prices can crash if the market reaches saturation, as one developer reported in response to this piece. As the market develops, new state programs have outlined plenty of detail to protect consumers and require adequate disclosure of risks and benefits to subscribers. Pages 29-35 of the linked program rules detail the recommended consumer protection measures. 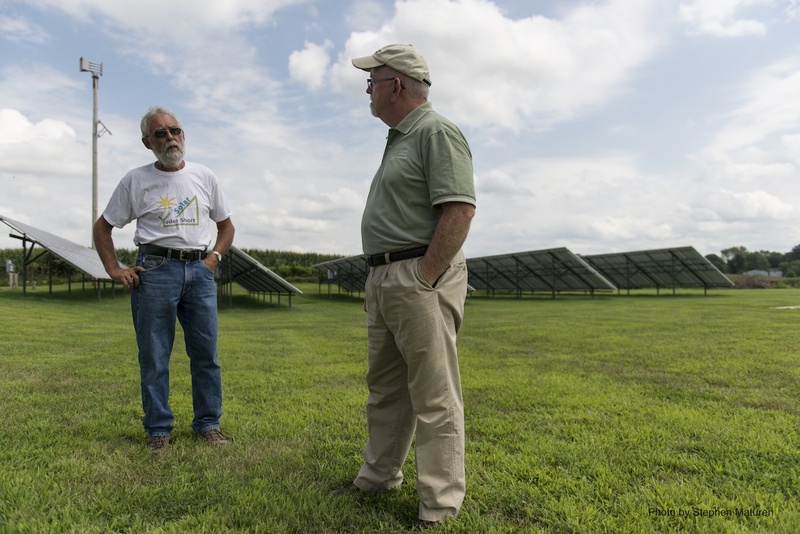 As state policies, community solar can differ significantly. The following table compares key program attributes of Minnesota’s nation-leading program, Colorado’s first-in-the-nation state policy, and New Jersey’s draft rules. In general, rules in bold are better. Overall, New Jersey’s program is a welcome addition. Its program rules reflect many of the best practices of prior programs and we expect to see robust growth starting in 2019! 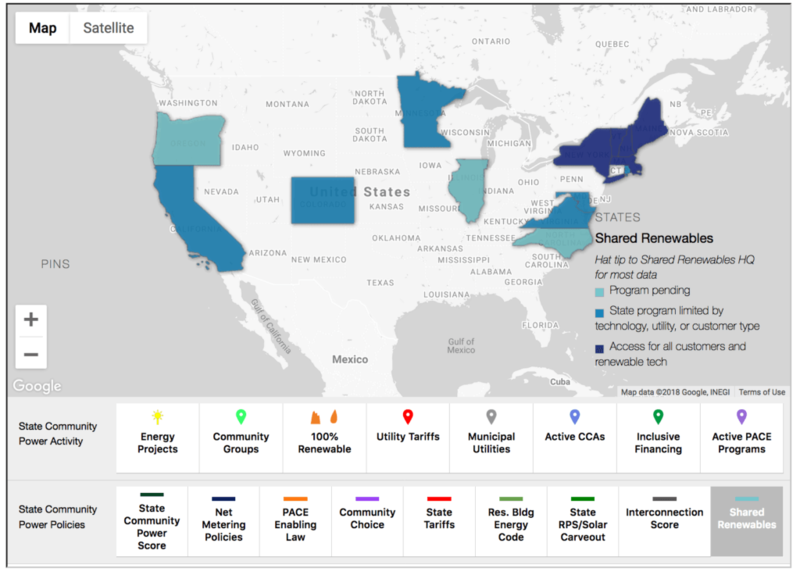 For more in-depth coverage on community solar, see ILSR’s Research Hub on Community Renewable Energy, the Shared Renewables layer on the Community Power Map, and our archive of comments submitted to state regulatory commissions.